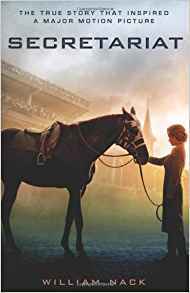 Based on an impossible true story, Secretariat is about a race horse who wins the Kentucky Derby and other races with record times that can still not be beaten to this day. It is a book of faith, speed, and you feel like your the jockey when you are reading it. And I want to read the book! ;) I loved the movie! they already had this book listed. Loved this book! It is very interesting! I've always loved horses, but with Secretariat, well, he tops them all off, Bold Ruler,etc. You need to read this book!! the book is confusing a little, but i had no trouble understanding it. It is around 550 pages. secretariat's story is just astounding in real life, especially for those who live by a race track and watch the horses run! (me) i agree it's not a read for under 12, but for those special cases. if you love horses, it's a great real story. and, if you're wondering how secretariat won that last race in the triple crown, scientist found he had a heart 3x bigger than the average horse! I checked this out from the library once, and I only finished the first couple of chapters. It was pretty hard to get into, and kind of confusing. But I'm only 11, so maybe it's a book more for older kids. who is the author of this book? i want to buy the book on amazon but i don't know it so please give me the author name so i can look it up. I wasn't too into this book. I found it confusing, and I'm 16 at a college reading level. I would definitely not recommend for younger children. I prefer Seabiscuit. pretty decent book.... very advanced though. includes a lot of bloodline info and family history of 2+ breeders the story is focused on, making it easy to loose track. They do describe the breeding shack scene in depth! Definitely not for kids under 12.